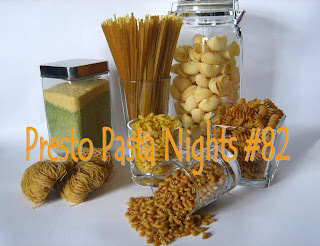 Last week, Psychgrad of Equal Opportunity Kitchen did a fantastic job in hosting Presto Pasta Night Roundup #81. She, too, had some tricky technical issues,but they were resolved and we all got to stuff our faces with great pasta. Thanks all for your tasty treats and thanks a million Psychgrad for doing such a fine job hosting. First in this week is Patsy of Family, Friends & Food. 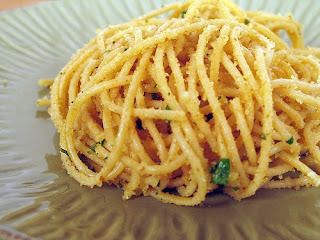 She shares the perfect "ready in a minute" comfort dish of Spaghetti with Garlicky Breadcrumbs...one of my favorite options. Sometimes I even add some tinned tuna or cooked shrimp....yum, wish I had some right now. And I couldn't resist her version of Rachel Ray's Florentine Meatballs over Spaghetti. Don't they look scrumptious? Next in Jin Hooi of Smell & Taste are my Memory does a Wicked Pasta after seeing the show. Sounds sublime to me. 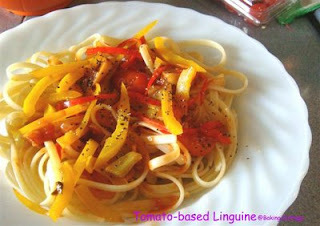 Aimei of Baking Cottage made her own sauce for her Tomato Linguine...she can cook for me any day. 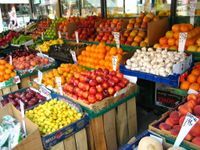 Graziana of Erbe in Cucina has a lovely blog and...I admit it...I'm jealous of her ability to grow peppers. 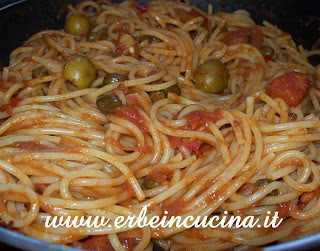 She shares one of my favorite pastas...Pasta alla Puttanesca. 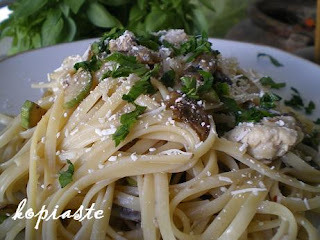 Maria of Kali Orexi is a first time PPNer and she shares a great dish - Pasta with Sausage and Porcini Mushrooms. Lucky her...before returning home from her trip to Greece she got all kinds of goodies from the relatives...do you think they'll adopt us? 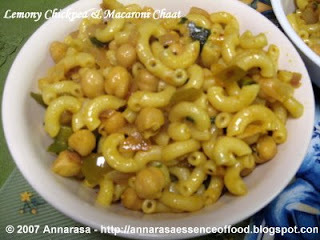 Apu of Anarasa- Essence of Food cooked up a very special Lemony Macaroni with Chickpeas Chaat...this one is truly unique. You HAVE to check it out. Ivy of Kopiaste has adopted a blogger and brings a great pasta dish to PPN...Check out the Fettucine with Chicken and the adopt a blogger program. 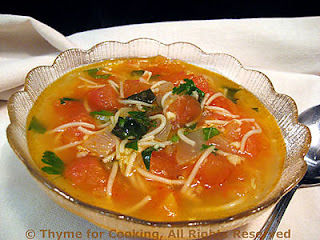 Katie of Thyme for Cooking is getting closer to the moving date (one week to go), but still finds time to make a luscious looking Tomato & Vermicelli Soup and even read a bit. Wish I were so organized...actually, it reminds me of my move a year or so ago...when I lived in denial much of that last month. Good luck with everything, Katie. 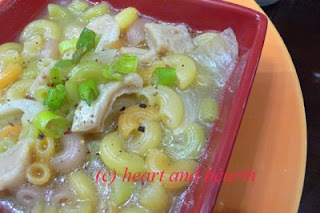 Ning of Heart and Hearth is back with a Macaroni Salad that didn't quite match the look of the vibrant pasta in the bag. Same thing happened to me, hoping for bright color to go along with a great taste...disappointed at the washed out color...oh well, bet it tastes delicious anyway. Happy Cook of My Kitchen Treasures found a wonderful dish somewhere else on the web...I do love the internet! Thanks for sharing this Garidomakaronada With Ouzo and Fresh Tomato. It looks fantastic. Avra of I've Got Food on My Brain finally discovered the perfect place for orzo...this Tuscan Bean Stew with Cabbage and Sausages. Judith of Think On It has been making some very quick dishes lately...under 30 minutes, which seems to be necessary in most kitchens. I think that even if you include the time it takes to boil water and pasta...this one still counts. 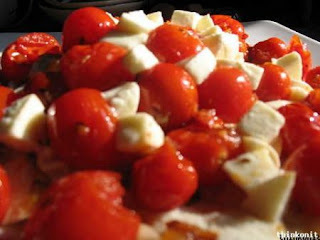 Cherry Tomato with Mozzarella Sauce. 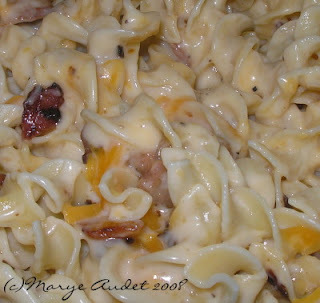 Marye of Baking Delights has the perfect blend for comfort...Noodles, Cheese & Bacon...need I say more?! Katie of One Little Corner of the World came up with this seriously tasty looking Chicken Pasta. Somehow I missed this fantastic entry from Kitchenetta of Got No Milk. 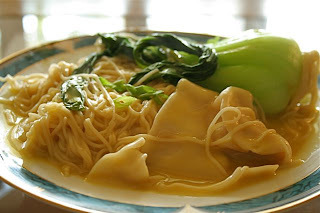 There's nothing as comforting as Won Ton Soup for the soul. And you can head over to Jaden's Steamy Kitchen to see the original and link to her video making some on CBS. And finally, my dish…or should I say dishes, since it really was a “twofer” ….two fer the price of one. Bucatini Bolognese easily converted to Baked Pasta. Good thing too,since my little angel has waaaay more energy than his Grandma. 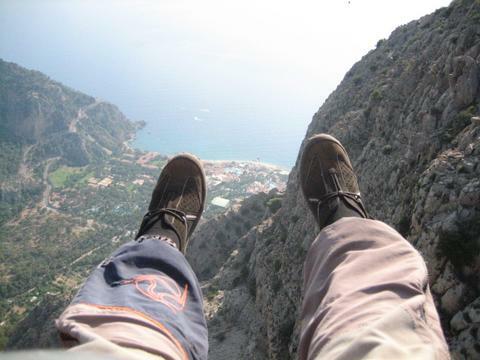 Next week's fabulous guest host will be Ulrike of Kuchenlatein. You can email your entries to her directly - ostwestwind AT yahoo DOT de. 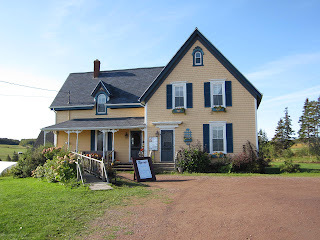 Plus...Don't forget to check all the Presto Pasta Night Roundups dating back to March, 2007, see who's hosting for the next four weeks and check out guidelines and tips for entering and hosting. Another gorgeous roundup! 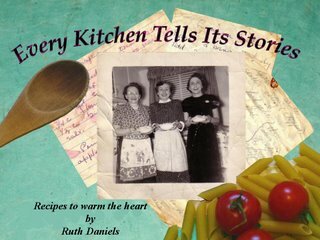 Wonderful recipes! 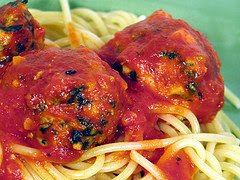 Thanks, and Patsyk...how could I not share those lovely meatballs with all the pasta lovers out there. What a great round up and dishes there! I'm sorry I missed this one! Can't wait to be back! Oh yum. Another great roundup. With winter coming, I want to just go through every roundup and make a list of different pastas to try every week.